← Why is it bad to work at night? From Ayurvedic point of view yogurt is heavy and mucus forming, not the weight reducing food it is fought to be. Especially unhealthy is yogurt when eaten cold and with fruits or berries. Indian cooking has a healthy alternative for traditional Western yogurt. 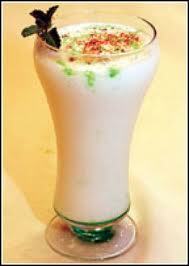 Lassi (Lassee) not only tastes delicious but aids the digestion process as well. Blending with water kindles the agni principle in yogurt (agni means digestive fire), making this combination excellent for digestion when taken at the end of the meal. – Blend ¼ cup of plain organic yogurt in 1 cup water with 2 pinches of ginger and cumin powder. – Yogurt, water + 1 inch piece of fresh ginger, ½ tsp cumin seeds of powder, 1/8 tsp salt, chopped cilantro leaves. – Yogurt, water + 2 Tbsp Sucanat or raw organic sugar, ½ tsp grated fresh ginger or ¼ dry ginger, ½ tsp cardamom. – Yogurt, water + 2 Tbsp Sucanat or organic sugar, 1 drop rose water. All varieties of Lassi are balancing for all three Doshas. TODAY’S TIP: All drinks in Ayurveda should be taken not colder than at room temperature. I understand not to mix beans with dairy. But would one of these lassis be okay after a meal with beans and grains? Yogurt qualities are changed through mixing with water 1:4, blending (adds fire energy), and adding spices. It says that yogurt is especially unhealthy when eaten cold. But if yogurt is kept at room temperature does it go bad? Also, if yogurt is cold then how should it be warmed up to eat or make lassi? Yogurt should be freshly made and eaten right away. What is sold at the store is very hard to digest. How could I make yogurt at home? By an ancient method? In the article “Cow products in Ayurveda” you will find recipes for homemade yogurt, kefir, cheese, paneer and dehin. Dehin is a very delicious kind of yogurt, I highly recommend to try it. Btw ,kefir aids my digestion. I m a vata type, with really delicate digestion, and kefir (ambient temperature) help my agni. To gain weight ,3-4 times a week, I make a smoothie with 2 well riped bananas, 2 soaked dates,25 grams soaked oat flakes,250ml (1cup) of kefir, whey protein, ashwagandha ,ginger,turmeric,cinnMon and ajust a bit of nutmeg. Delicious, nourishing and really easy to digest!